The Writeous Babe Project: What Would You Do If You Weren't Afraid to Fail? 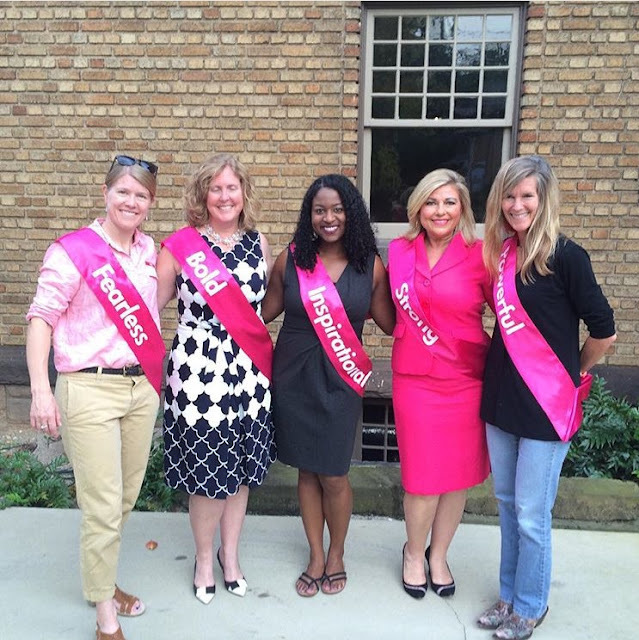 Last Thursday I walked into the Clubhouse on Highland and was greeted with handshakes, hugs, and a hot pink sash. "Inspirational" it read. I draped it across my body noting the nice contrast with my grey dress. I smiled as my proud husband took my photo for the obligatory Facebook and Instagram posts. This question was at the center of the night's event, dubbed An Evening of Empowerment. I was being honored that night by Girls On the Run Birmingham as one of four local "Women Who Inspire" and with Molly Barker, founder of Girls on the Run International. But I didn't feel inspirational. I felt like a mess. I'm supposedly inspirational because of See Jane Write, a membership organization for women writers and bloggers that I run. I host workshops, seminars, and networking events to empower women to share their stories. I work as a blog coach. I freelance for a number of local media outlets, mostly writing about feminism and women's issues. I'm an English instructor at the Alabama School of Fine Arts, where I also teach an elective called Women and the Media. It's like Journalism 101 meets Women's Studies. I teach my students (mostly girls, of course) how to write for the web but also how to intelligently examine representations of women and girls in the media. All that sounds so inspiring, doesn't it? But all of that is killing me. I've been so busy that that my stress level has been affecting my health, I've stopped exercising and I haven't cleaned my house in three weeks. One day recently I completely forgot to shower. I've spent the past month devising a plan to end See Jane Write and crafting an email to tell my boss I want to stop teaching my elective, only to scrap the plan and delete the email. None of this is inspirational. After mingling and munching on appetizers, the honorees and attendees all gathered before a large screen to watch The Empowerment Project, a documentary that follows the journey of an all-female film crew as they drive more than 7,000 miles from Los Angeles to New York over the course of 30 days to capture the stories of 17 powerful women in a variety of fields. At several points in the documentary the filmmakers turn the camera on themselves asking one another and the audience: What would you do if you weren't afraid to fail? While watching the film I started crying and couldn't stop. I'm still not sure what caused the tears. Maybe they were tears of joy because I was so inspired by the women featured in the film, women like mathematician Ami Radunskaya and Vice Adm. Michelle Howard, the first African-American woman to command a U.S. Navy ship. As Sarah Moshman, the lead filmmaker on the project, once told Marie Claire magazine, "Our film is like a badass career day." Sandra Clifford, pilot and cofounder of Women in Aviation, is also featured. In the film Clifford says that the thing that made her proudest in life had nothing to do with flying. She was proudest of inspiring other people, especially other women, to be the pilot of their own lives. Maybe I cried because with those words I knew my purpose in life -- to help women and girls be the author of their lives. Or maybe I cried because I realized I can't empower women and girls to be the author of lives because I'm not the author of my own. Very rarely has fear kept me from going after my goals. In fact, this year I've pursued my dreams with reckless abandon. I can't say I regret that -- no matter how exhausted I am as I type these words. I've accomplished so much. I've launched two e-courses, started a mastermind program, spoken at important events, grown See Jane Write in ways I never imagined, and won awards like Birmingham Business Journal's Top 40 Under 40 and now this distinction from Girls on the Run Birmingham. Even while being a complete mess I have managed to inspire people by going after and achieving my goals. So I regret nothing. But as GG Renee of All the Many Layers so eloquently wrote in a recent blog post, "Goals are fine, but some of us need magic." And that's exactly what I need right now. I need the magic that comes from writing simply because you love the act of weaving together words and stringing together sentences. I need the magic that comes from muses. I need the miracles that come from God. If I weren't afraid to fail, I would give myself a break. If I weren't afraid to fail, I'd trust that old saying that "What God has for me is for me" and stop chasing my dreams until I'm out of breath. If I weren't afraid to fail, I would give myself the grace to write for myself and for my love of the written word. I am a mess, a beautiful mess, an inspirational mess. This speaks to me...volumes. I have finally come to see, for me, that so much of my life is about moving in and out of the messiness. To be okay with those peaks and valleys of confidence and know that just on the other side of whatever "mess" I'm going through is a breakthrough to something new and empowering. I also know that I need to reach out, write, meditate, run...do whatever it takes to wade through all that messiness. I don't normally comment on blogs but your post really spoke to me- I think that we all feel this way (often!) and don't feel like it's okay to say out loud... One of my favorite lines from the film was from the professional athlete... she said something to the effect of "as women we give and give- our time, our talent- and sometimes we need to remember to keep some for ourselves." It was a refreshing reminder that we shouldn't be afraid to slow down and give to ourselves. Thank you so much for taking the time to comment on my blog, especially since it's not something you normally do. I really appreciate it and appreciate your words. That quote from the movie really spoke to me as well. Javacia, this is so important. Thank you for being vulnerable and expressing something that is so hard to put into words. What is truly incredible is the sheer breadth of what you have accomplished - a true testament to your willpower and passion as a woman and a leader. It is absolutely magnificent to observe everything you have given the SJW community and the women of Birmingham. But you are right - it's time to give to yourself. You deserve it. I used to think that the harder I slaved away and ignored myself, the more badass I was. I used to think that working my 8-5 job, being on call for that 8-5 job 24/7, coming home and working on Birmingham Bloggers/my own blog until I went to sleep, not cooking myself dinner to answer emails instead, etc. meant I was determined and passionate. It did mean that. But for me, it also meant I was lacking perspective, time management, and self-love. It was rough learning all that the hard way. Thank you for the reminder that being badass means loving yourself and being real. Self-love is part of the girl boss dialogue. Thank you so much for your comment, Meredith. You know, I often think about you and Beth and other young women in Birmingham that I know are watching me and I just want to be a good example. And lately I feel like I'm not because I have been behaving as if being badass meant never making time for yourself. But as you so eloquently said, "Self-love is part of the girl boss dialogue." Wow, wow, WOW. This is so powerful. I'm so glad you're giving yourself a break and taking care of YOU. That's what's most important. It's like they say on planes---you have to put your oxygen mask on before helping others put on theirs. We love you and we love SJW, and no one is going to let it fall by the wayside because you're taking a break. We're a strong community because you made us strong. We're behind you all the way! Thank you so much, Mandy. And thank you for always being my right hand woman at events! I love this and appreciate you sharing! I think we all struggle with this as women and don't ever take the time to step back and celebrate the little things because we are so busy working on the big things. You are an inspiration and are making a difference in so many lives - many of which you probably don't even realize. Keep us the great work and just breathe! Thank you so much for your sweet words, Mary Katherine! I appreciate you taking out the time to read and comment. It breaks my heart to hear you were having so much trouble. Another reason why I'm dedicated to being in Bham more! Thanks for not giving up! Thank you for reading and for those kind words, but please don't ever feel pressure to be in B'ham more. You have a lot going on and I know constantly making that drive can be rough. Make sure you're taking care of yourself. Our friendship is wider than the 51 miles between us. This is the most transparent I've seen you be in a long time, perhaps ever, and it's very refreshing. Thanks for this, and enjoy your writing.